Living in the Virgin Islands, it’s a different culture. In fact, it’s a lot of different cultures. 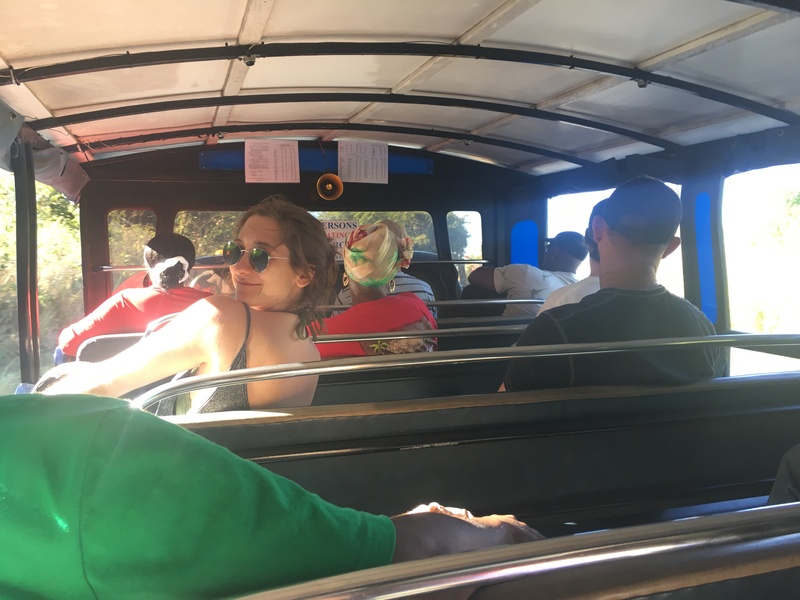 I see it every day when I’m catching a Safari, which is the public transport open-air trucks that zip me to where I need to go for $2. Some times when I’m waiting at the Safari stop, I’ll see one approaching and put out my arm to wave it down. But it doesn’t stop. Why? Here’s my cousin Katherine as the only other white person on the Safari. people who I normally sit next to. Those vehicles cost 10 times as much as what I and every other working stiff on island is used to paying. The drivers, somehow, can spot the difference between me and the tourist. So many differences, just in our neighbors. And, if you look for it, you can find even more differences. For example, if I enter a store and do not say “Good morning” or “Good afternoon,” or the odd greeting of “Good night,” then I am ignored. It doesn’t matter what color I am; I’m considered rude if I do not say these magic words. It’s pretty easy to find people with a big chip on their shoulder here. There are so many people who have been done wrong and are now simply waiting for the next shoe to drop. These folks are protecting themselves by building walls. Another thing in common? The love of good, local food. 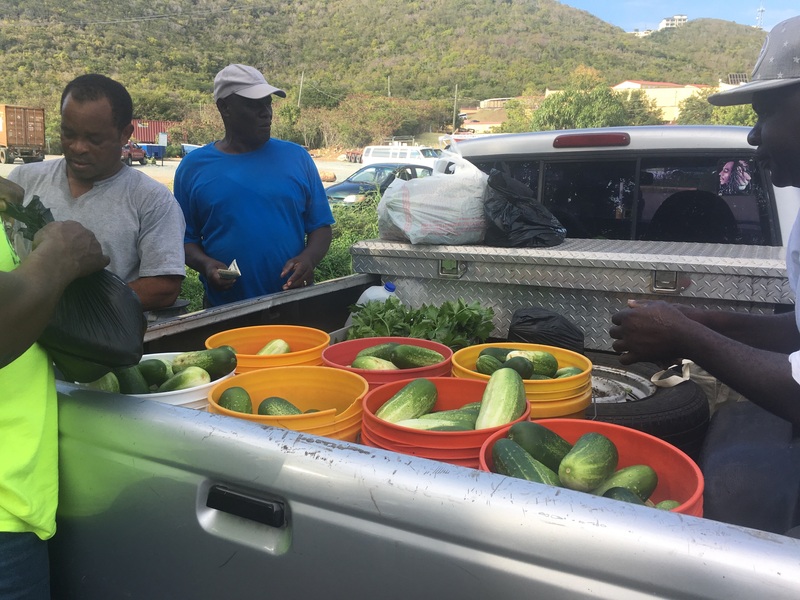 So when the truck pulled up with buckets of freshly picked cucumbers, they led me right over to buy some with them. In their accent, they pronounced cucumbers as “kookaburras.” Yet another example of how differences are actually similarities. So, do you find yourself looking for differences or sameness? Are you fearful of those who are different than you? Because difference can be scary. We don’t know the culture, what they expect or think. Who knows how their mamas raised them. I’ve met many people, though, who seem a lot like me, and I come to find out their mamas didn’t raise them right at all. I encourage you to look around at people you meet and decide they are just like you. As a newspaper journalist, I quickly realized that the janitors, secretaries, bailiffs and other marginalized people were much more important to my work than those who carried a title. I made it a point to address politicians by their first names, just like I did their assistants. I want to view everyone as equal to me, because they are. It’s lazy to decide that one person is different or better because of something as simple as looks or style. I’d much rather expand my world by accepting different types of people into my life. That’s why I’m constantly looking for the same. Because we are all one, aren’t we? We’re all part of this beautiful universe, working together to provide each other opportunities for growth. So those who challenge me and those who support me, I thank you both. To me, you are friends on my path, and we are the same.